In East Falls Church, on the block bounded by Lee Highway to the east, Fairfax Drive and I-66 to the north, the County and City of Falls Church boundary to the south and North Little Falls Road to the west. The site is adjacent to the Washington and Old Dominion Trail. The applicant has placed this site plan application on hold, effective October 2013. This page will be updated should the applicant choose to restart the process. 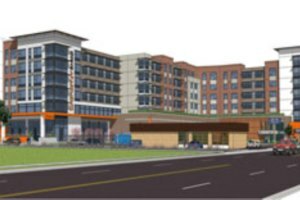 The applicant, Shreve Apartments, LLC, proposes a new site plan for the 74,360-square-foot Shreve Oil site at 6873 and 6881 Lee Highway in East Falls Church. Rezone the site from M-1 and CM to C-O-1.5 Commercial Office Building, Hotel and Apartment District. Construct a five-story residential building with 180 dwelling units and 1,449 square feet of ground-floor retail along Lee Highway.